Aussies are drinking less alcohol according to Roy Morgan’s latest research. It reported 67.9 per cent of the Australian population aged 18+ have consumed at least one type of alcohol in an average four week period. It reported a gradual decline over the last five years from 70.1 per cent recorded in 2013. All major alcoholic drinks have declined in incidence over this period, except for cider which has increased. Roy Morgan’s Alcohol Consumption Currency Report September 2018 conducted face-to-face interview with over 50,000 consumers per annum, questioning of over 15,000 regarding their alcoholic drinking habits. Wine is the most popular alcoholic drink for Aussies, according to Roy Morgan’s latest report. It is consumed by 43.3 per cent of the 18+ Australian population over an average four week period, ahead of beer with 38.4 per cent and spirits on 26.7 per cent. Cider is now consumed by 12.3 per cent which has increased from 10.3 per cent five years ago, making it the only type to increase. The incidence of cider drinkers is now ahead of RTD (11.4 per cent), Liqueurs (7.2 per cent) and Fortified Wine (5.2 per cent). Over the last five years the biggest decline was for wine (down 1.3 percentage points), followed by RTD (down 0.9 percentage points) and Liqueurs (down 0.8 percentage points). Beer only showed a decline of 0.5 percentage points and as a result closed the gap marginally to wine. “There is a gradual social change in Australia over the last five years in terms of a declining incidence of alcohol consumption. This is evident by the fact that five years ago 70.1 per centof Australians 18 and over consumed an alcoholic drink over an average four week period; this has now declined to 67.9 per cent currently. The potential reasons for this decline are likely to be as a result of switching to healthier options, cost, social issues involved such as drink driving and alternative drug taking,” Michele Levine, CEO, Roy Morgan said. The study showed that men drink more than women. About 73.3 per cent of men consume alcoholic drinks, well ahead of women with 62.7 per cent. 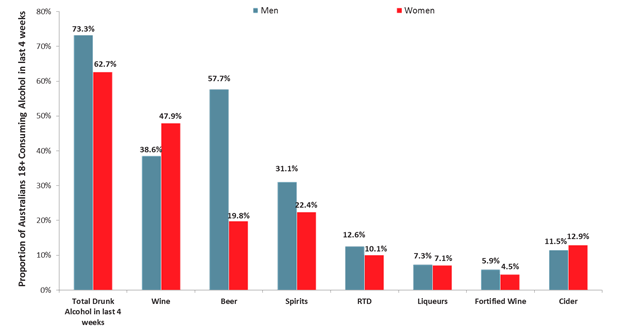 The drink preferences are very different between the sexes, particularly when it comes to beer, which is drunk by 57.7 per cent of men and only 19.8 per cent of women. The preferred drink for women is wine with 47.9 per cent, well ahead of men on 38.6 per cent. The only other category were women have a stronger preference than men is cider with 12.9 per cent, higher than the 11.5 per cent for men. Despite wine being the most popular drink in Australia, beer is still on top in terms of volume (based on glasses). The following chart shows that beer accounts for 45.2 per cent of the volume of alcoholic drinks consumed, well ahead of wine (28.3 per cent) and spirits (13.4 per cent). “With the overall decline in Australians consuming alcoholic drinks has also come changes in the types of drinks they consume. Although beer retains its top position for market share (45.2 per cent)in terms of volume consumed, over the last five years this has declined by 2.9 percentage points, with gains largely going to wine, up 2.3 percentage points and cider up 1.0 percentage points,” said Levine. 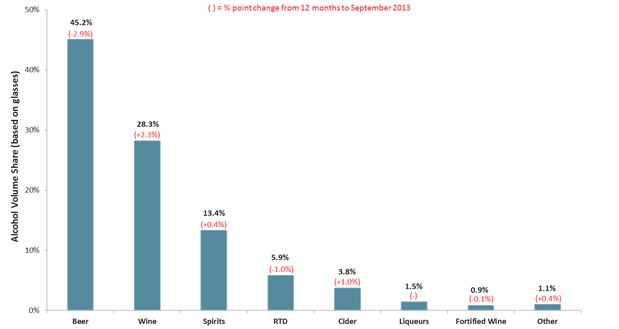 Since 2013 gains in share of volume were seen for wine (up 2.3 percentage points), cider (up 1.0 percentage points) and spirits (up 0.4 percenatge points). 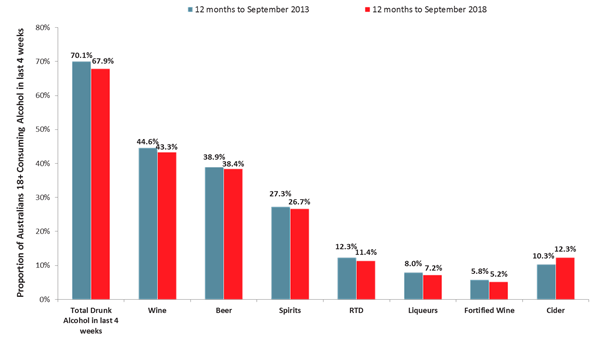 Losses in share were greatest for beer (down 2.9 percenatge points) and RTDs (down 1.0 percentage points). “The retailing of alcohol has also undergone significant change over the last five years with supermarkets (including all the outlets they own), now accounting for 75 per cent of market turnover, an increase from 73.3 per cent 12 months ago. The Woolworths Group (including Dan Murphy’s and BWS) are the clear market leaders having increased their market share over the last year from 49.0 er cent up to 52.1 per cent,” Levine concluded. ‘Liking’ alcohol brands linked to risky drinking Aussie drinking habits revealed in 100-glass breakdown Aussies’ drinking habits revealed Who is drinking spirits?